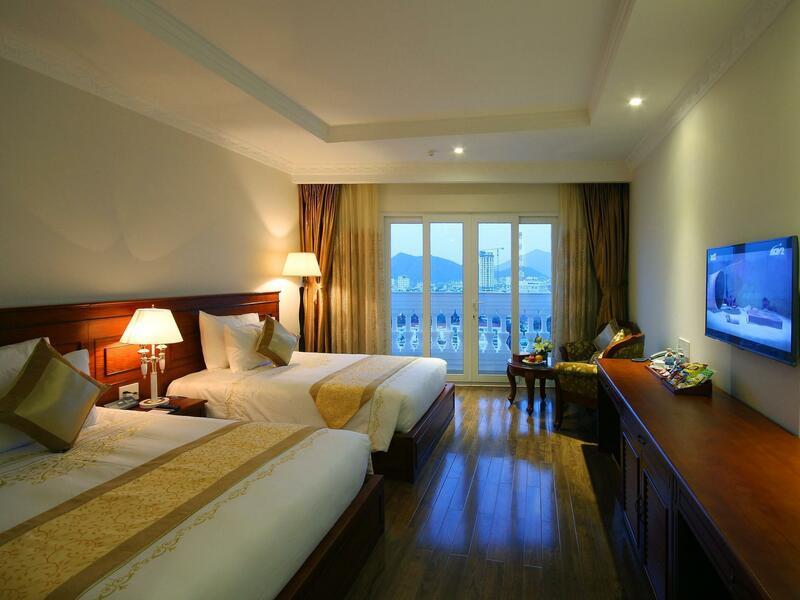 "New hotel large rooms beautiful view great breakfast terrifi..."
Have a question for Nha Trang Palace Hotel? "Good clean and friendly staff"
"Value for money, located near many nice restaurants, it is also within walking distance to a famous massage spa." 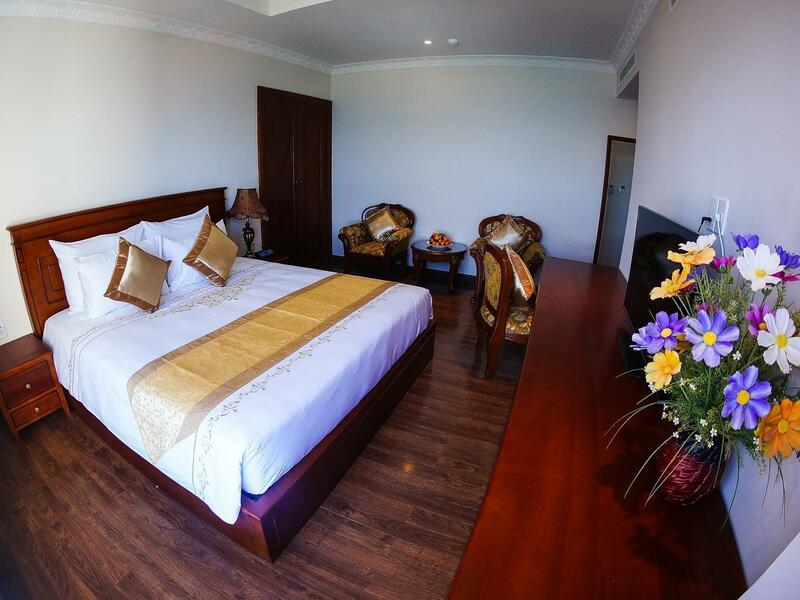 "Fantastic location, clean and friendly"
"Nice hotel within walking distance to many restaurants and t..."
Whether you're a tourist or traveling on business, Nha Trang Palace Hotel is a great choice for accommodation when visiting Nha Trang. With its location just 0.5 km from the city center and 38.1 km from the airport, this 4.5-star hotel attracts numerous travelers each year. With its convenient location, the hotel offers easy access to the city's must-see destinations. 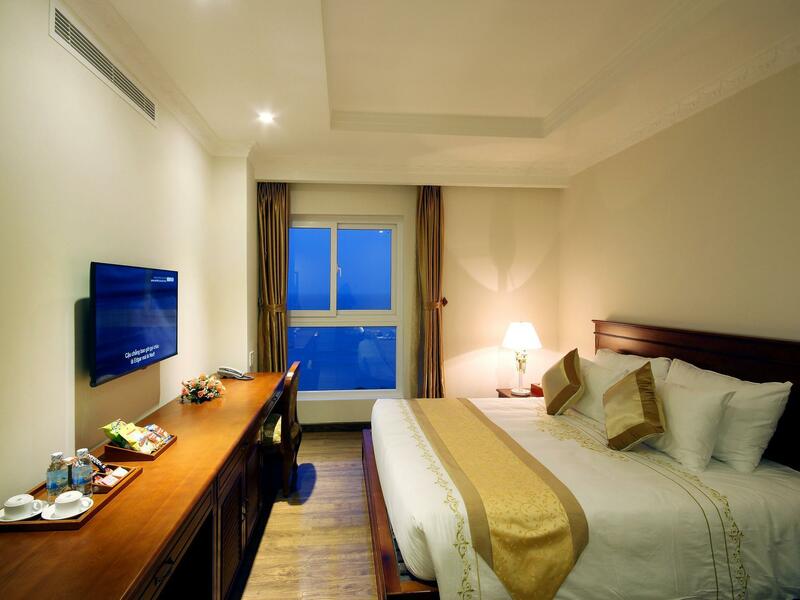 At Nha Trang Palace Hotel, the excellent service and superior facilities make for an unforgettable stay. While lodging at this wonderful property, guests can enjoy 24-hour room service, free Wi-Fi in all rooms, 24-hour security, gift/souvenir shop, taxi service. The hotel features 170 beautifully appointed guest rooms, many of which include television LCD/plasma screen, complimentary instant coffee, complimentary tea, mirror, slippers. The hotel's fitness center, sauna, outdoor pool, spa, massage are ideal places to relax and unwind after a busy day. 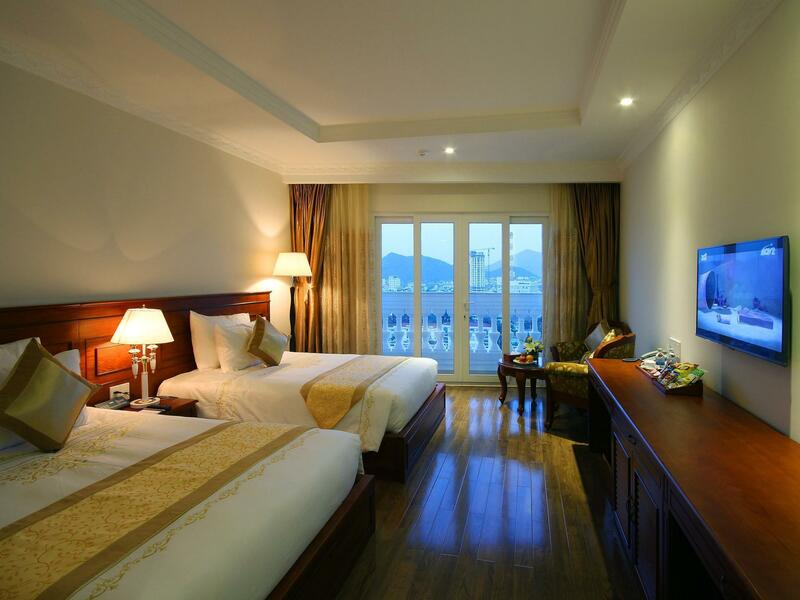 Superb facilities and an excellent location make the Nha Trang Palace Hotel the perfect base from which to enjoy your stay in Nha Trang. "Nice and new hotel with classic exterior." Maximum 2 children under 12 years of age is allowed in each room. Children under 6 years of age stay free of charge when using existing beds. Children from 6 to under 12 years of age is charged directly at hotel upon check-in for breakfast when using existing beds. Guests from 12 years old are considered as adults. Position is good. The airport bus drop off and terminal bus back to airport is very near to hotel. If you want to save transport cost (just US $ 2.14 = 50000VND). Nha Trang center is nearby, it has food court and brand name goods to buy. You want go outsise visit. Some taxi is alway waiting roadside. We stayed at the palace hotel for two nights. We booked the seaview room.However, I took a glance at the sea if i stuck my head out of the window. The front desk prepared the breakfast since we have to check out at 4:00am. It is beyond my expectation. The facilities at this hotel is a little bit old but the overall stay is satisfied. I booked the hotel for 1 night and was happy with my stay here. The hotel is located near the beach, only 3 minutes to walk to the beach. My room is large, clean and has a nice balcony with sea view. Hotel staff are helpful and polite. Breakfast at the hotel is great with lots of choices for food. Recommended. The hotel is just a few steps from the beach. The staff are helpful and courteous. Breakfast is great with lots of dishes for my choice. My room is great with large windows and nice view. 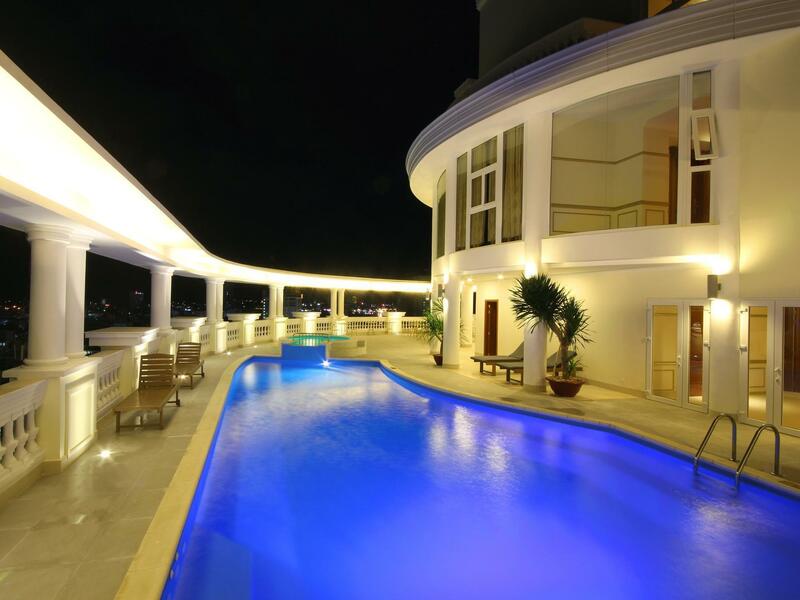 One of the best 4 star hotels in Nha Trang. Recommended. Deluxe room was spacey, with a great view of Nha trang beach. Bed is good and comfy. Wifi works well. The bathroom has a bad smell, though (probably because of bad plumbing with the toilet). Breakfast was just so-so, and skip-able. This hotel with its ocean view room was beautiful . Our room was very spacious and lovely. The bed and pillows were the best that we ever slept in. We should have inquired about the pillows before we left. The cleaning lady on our floor was very pleasant. We would most definitely stay here again. We enjoyed going to the Dam Market, did lots of good shopping there. Nha Trang was a stunning beach city. With well kept beautiful gardens all along the beach front. 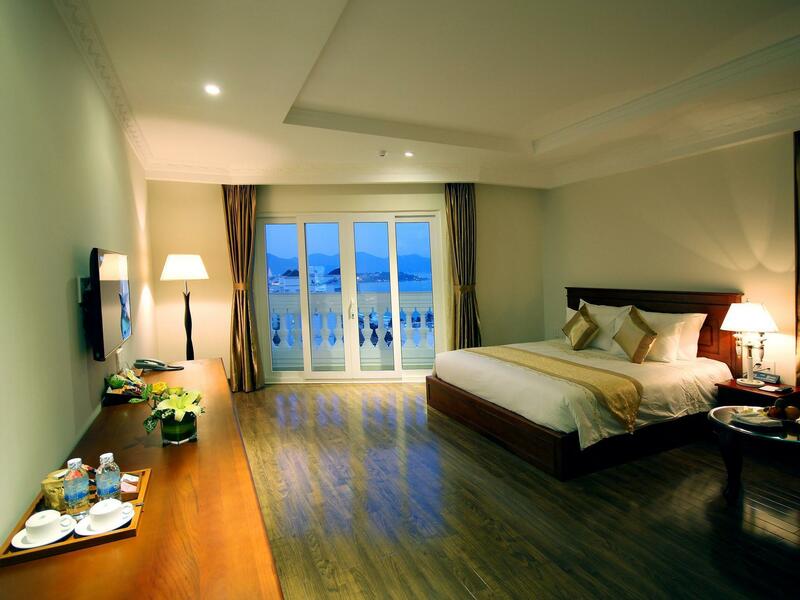 Everytime visit to Nha Trang, I always book this hotel to stay because location very near the beach just 100 meters. The interior and stuff in room very new. I was staying at the hotel for 3 nights. The room was big with a nice sea view. The service was mostly mediocre especially with the restaurants, with no one to even complain about at the restaurant itself. Like, the food in each of the days while breakfast was constantly being consumed with no one from the team to refill it. the same applies for requests not been fully delivered. The Air condition was shutting itself while at the night time. I am not familiar with it in any other hotel I was staying at. Big construction site next door, will take years to finish. You cannot sleep whatsoever, when they start working at 6am.. driving me insane.....!! No afternoon nap either. Very very loud noise that constantly pounding your head. 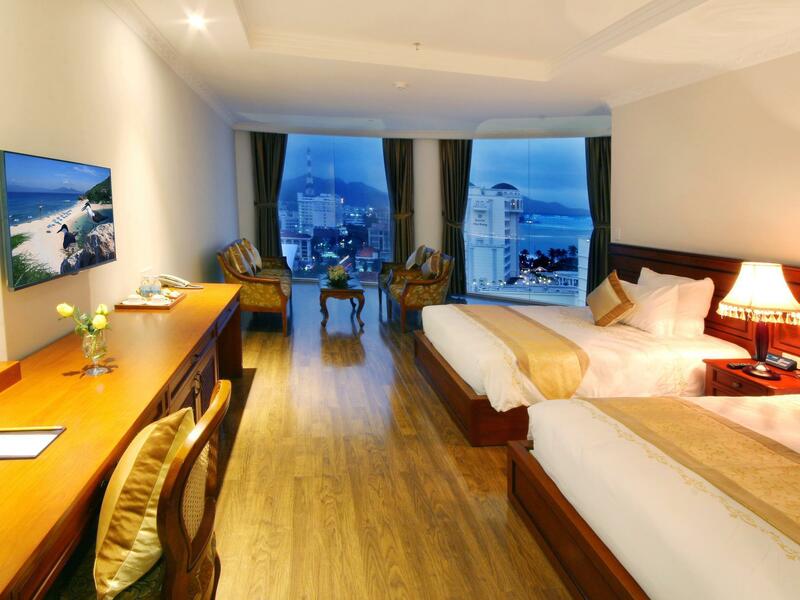 Review about Nha Trang Palace Hotel: (3 nights stay) 1. I was given a room with twin bed, although I "booked" double bed and put note at the end of the checkout to Agoda. 2. Check in counter person wants to hold on my passport without letting me to choose to pay deposit of 1million VND. I ask whether can I get my passport because it's important, then he said about the deposit. 3. Second day afternoon, my room was out of power when I got back. I called and the maintenance team have to come and bring a ladder to my room and switch back the power kick off above the ceiling. It's dark and I am exhausted from work and have to wait for 30 minutes for them to be in my room. 4. The team for making up my room did not fill in the shower gel, soap, etc but I was fed up to ask, I used my own that I always brought. 5. There are no iron and iron board or place to iron your clothes, you will be forced to pay for the people to do it for you (laundry team). This is the first hotel I've seen doing this, even cheap/budget hotel have all those items. 6. The English is not good for all the staff and this makes me having a nightmare often there. So please, I am begging you not to stay here. No wonder I got discounts through Agoda, unfortunately I felt like I've been cheated by the hotel. We spent an interesting trip in Nha Trang in Nha Trang Palace hotel. Everything is quite good. The staff are friendly. We stayed in the 3002 room, which is on the 3rd floor, not so high but enough to see the sea and sunrise. But some facilities in the room we were not satisfied. The refrigerator is not cold, the tub bath is leaking so after shower, toilet floor always get wet. Staff wanted to keep our passports with them at front desk, we were not going to let this happen. Expect to pay a deposit of $100 US each room even though the rooms were already paid for, we thought this was pretty steep. No hot water when I wanted a shower in the evening on all 3 nights we were there, had to shower in the morning. Breakfast pretty average. Pool bar had no service. On the positive side it had a good location, nice veiws. Would we stay there again, probably not. Overall we have a good stay at the Nha Trang Palace. The location is near everything and only a few meters from the beach. The hotel was recently renovated and is still adjusting to its new level. Beach chairs are not enough and the room needs to add more reading lights, chair... To provide a real 4 * service. Staff, however are very nice and helpful. Remarkable room service!! Awesome entrance hall!! Nice sea-view room! It was the biggest hotel on our trip so far. Very impressive! The room service was absolutely perfect!! The waitresses at the breakfast were a little bit grumpy, but the service boys and receptionists were very helpful. Breakfast buffet was huuuuge! The room had a sea-view window: absolutely awesome waking up during a sunset!!! I travel a lot around Vietnam and this is one of the best hotels I ever stay here. Hotel is located just few steps from main beach road. Around hotel you have many good coffee shops as well private beach which is very clean. This is new hotel so everything is in great shape and clean. Stuff very kind and willing to help you with all kind of your wishes. Restaurant is nice and comfortable for breakfast you can eat like king, buffet is amazing! Swimming pool inside hotel is very comfortable and not to crowded, you can go to swim also late night. Rooms are comfortable during my stay there I sleep in superior double bed and feels like small studio. Everything is very clean! Stay was great. Russian people has a gentle souls,beautiful people, they are trying always to help from the heart to the best advice. If you approach them well, their genuine outcome brakes arrogant attitude,one problem they are can not speak English well. Breakfast great with good variety, defenatly satisfied our Aussie taste. 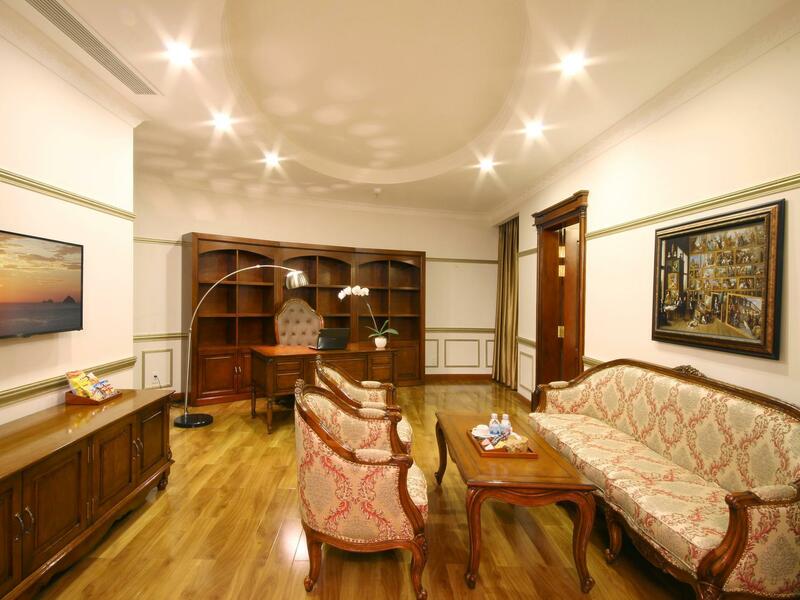 Clean hotel, excellent location, next to best bakery in city and tea house in each corner.